Many of you must have heard already that Sir Richard Attenborough passed away on Sunday, August 24th. I don't know if anyone reads this blog, but I am posting these words because I feel like I have to say them to someone. I have never been a movie buff, so my knowledge on classic movies is very limited - I have yet to and look forward to seeing more of Richard Attenborough's work in front of and behind the camera. But "John Hammond", the character he played in Jurassic Park, has resonated with me ever since I saw the movie when I was a kid. To me, his character embodied eternal optimism and a complete disbelief in the concept of "impossible" - exactly the kind of person I wanted to become. I imagined myself in the distant future wearing a white beard, using a cane with a mosquito encased in amber, doing everything I always dreamed of - just like John Hammond did. This past year and a half I worked on a single project, day in and day out (I even left my job to work on it). Inspired by Jurassic Park, I had taken on the task of trying to model, texture, rig, animate and light a dinosaur. The timeline to finish it stretched out much further than I had planned. I would be lying if I said that the process didn't feel grueling and that sometimes the purpose of me doing it felt completely lost. 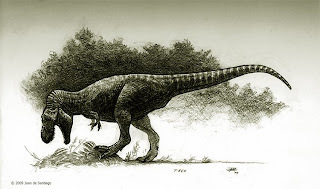 During all that time, what kept me afloat was listening to the story of John Hammond, as wonderfully narrated by Richard Attenborough himself for the Spielberg-produced PC game "Trespasser". 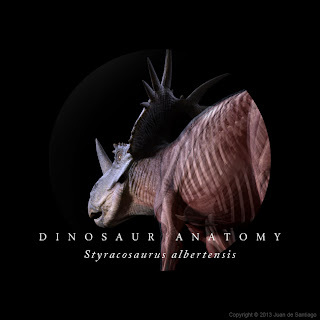 I listened to his entire narration over and over - perhaps more than a hundred times - about how John Hammond created InGen, set up the genetic engineering lab on Isla Sorna and cloned the first dinosaur. Like in some benevolent hay fever dream, I worked imagining myself living the story of John Hammond, bringing to life his first dinosaur. Perhaps this was a type of madness, but I finished my dinosaur project exactly as I intended it to and I am certain I wouldn't have done it without the inspiration I got from Richard Attenborough's masterful narration and portrayal of John Hammond. When I was in my last year of animation school, I picked up a book at the library about the principles of lighting for theatre. I wanted to apply these principles to my final student film. I was surprised when I opened the first page of the book to find that the foreword had been written by none other than Richard Attenborough (or "John Hammond", as I referred to him my entire childhood). I knew instantly that this was no coincidence. He closed the foreword with one word in quotations, which he said was the most important thing above all in everything we do: "Enjoy". I know that much more of his work and words will keep weaving themselves into my life, both personally and professionally. Thank you Richard Attenborough, for the words of wisdom and inspiration. These are just 3D rotations of the rough texture tests I did before for the Dilophosaurus, there are still no fine details on these textures, just blocks of colour. 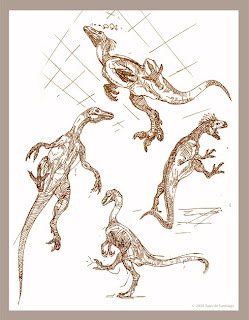 I think I'll go for the brighter green-yellow-orange one, I think it suits the Dilophosaurus better, but I'm not sure. 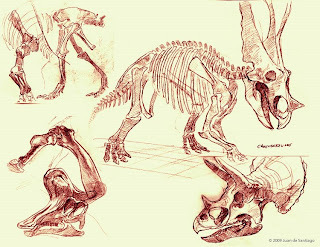 These are some dinosaur fossils I sketched at the ROM today with some friends. The dinosaur exhibit there is amazing! (I've probably said this before, but I just never get tired of going to see these dinos at the museum). This time I used a 6B pencil. 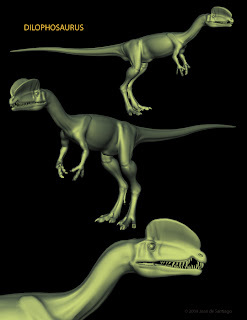 The other image is just a rough texture test I did for the CG Dilophosaurus I've been working on. Hi everyone! It's been a long time since my last update, but I'm back on track now! hahaha (I think). 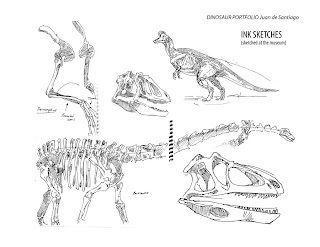 Here are some quick ink sketches I did when I went to the Royal Ontario Museum about a month ago with a friend. I also just came back from an awesome trip to Montana. I went to dig up dinosaur fossils alongside Paul Sereno and his crew, it was amazing! A dream come true. I literally stared at the badlands for hours, sitting outside the lodge during our breaks from the fieldwork. Being in a place with so much dinosaur history (arguably, the part of the world with the most dinosaur history until today) moved me and recharged my batteries, so to speak. 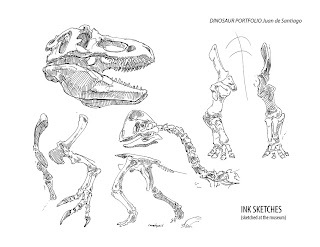 Also, I'm posting the design drawing for my next sculpture, a T.rex. Please feel free to critique it, the sooner I can fix it the better (before sculpting it). Thanks! These are just some semi-quick ink sketches I drew yesterday (I had no reference, so I drew them from memory). Some of my friends suggested last year that I try drawing dinosaurs from different angles from the ones I'm used to, so that inspired me to try. 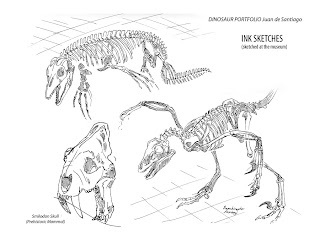 These are just generic theropods, they're not any specific species. I'm a Sheridan College BAA Animation graduate. Welcome to my blog!